The lines have been drawn. Show your allegiance at the 2018 CIC. See new schedule, speakers and talk titles at CatholicIdentityConference.org. It seems a bit like the world might be ending. Right? But it’s seemed that way before, and yet God had other things in mind. Catholics must trust in God and, yes, prepare for the worst. 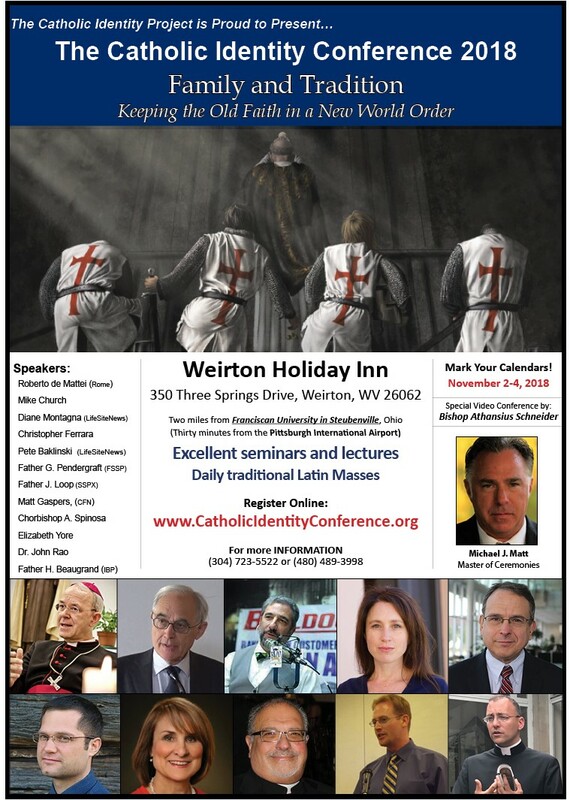 And the Catholic Identity Conference 2018 is all about that. CIC 2018 is less than two months away. This will be a meeting of Catholic minds during the worst crisis in Church history. Catholics from all across the country and Canada will come together to listen to journalists from the premier magazines and centers of Catholic action—including The Remnant, LifeSiteNews, Catholic Family News, the Lepanto Institute in Rome, the Mike Church radio program, the Roman Forum, Catholic Lawyers and more. Priests from the major traditionalist orders and fraternities—including the Fraternity of St. Peter, the Society of St. Pius X, the Institute of the Good Shepherd, Christ the King and diocesan will provide the spirtual firepower. Last year’s event attracted 500 people, and we had to deal with some overcrowding. We don’t intend to let that happen again. So, the sooner you register the sooner we can expand our accommodations to prevent overcrowding. I’m very much looking forward to seeing you there. Let’s help make the Church Catholic again!